Over the course of his life, Stefan Zweig was a most prolific writer, known not only for his novels and plays, but also for a wide range of historical and literary biographies. He has been criticized as a lightweight by those who fail to appreciate his charms, but it is difficult to deny the passion for literature and lifelong learning that informed his work. With his biographical subjects he followed the topics and personalities that caught his attention and, perhaps as a consequence, he was drawn to write about those whose work and ideas he admired, as well as some of the figures who played darker roles in history. The last of the writers to captivate him, the subject of his final book, was Michel de Montaigne. Hitler’s rise to power in 1934 drove Zweig from his native Austria to England, but by 1940, with Europe torn apart by war, he crossed the Atlantic to New York City where he stayed briefly before moving even further to Petrópolis, a German community in Brazil. Here in the mountains north of Rio de Janeiro, far from the library he been forced to abandon in Vienna, he would uncover a dusty copy of Montaigne’s Essais in the cellar of his house. He made this fortuitous discovery in the autumn of 1941 and his delight in it would preoccupy the final months of his life. In February of 1942, Stefan Zweig and his wife were found dead in their home. It is not certain but, as much as Montaigne provided him the comfort of a kindred spirit speaking out across the centuries, he may have also inspired or reinforced his decision to end his own life. Zweig opens his biography with a confession that when he first encountered Montaigne at the age of 20, he was filled with youthful idealism for the new century that was dawning. He could not imagine what relevance he might find in this “Frenchman already yellowed by time and lost in the riddles of his Latin quotations”. Ahead he could only envision the prospects of peace and progress. Rediscovering Montaigne 40 years later, he found immediate parallels between the violent upheaval of the years of the Reformation and the devastating collapse of 20th century glory into the brutal waves of intolerance and destruction sweeping Europe. Curiously, the age of 20 was also the age at which Montaigne himself decided to end his formal education on the conviction that by 20 the soul is formed and thus, beyond that point, the spirit will not be further enhanced. He would, of course, turn his attentions inward in his lifelong effort to understand that soul. There is, in the course of this short biographical account, little that will be new to anyone acquainted with the general details of Montaigne’s life and writings. What is of more interest is what this essay reveals about Zweig’s mindset in the last winter of his life. This is very clearly a personal undertaking. Even though Zweig set about researching the social and political context in which Montaigne lived, the resulting work was never subjected to a judicious edit and, as it exists, it tends to be overly repetitive in some aspects, especially where Zweig’s enthusiasm runs high. He finds in Montaigne a friend, a wise counsel so desperately needed when his own despair at the state of the world is reaching an all time low and, as such, he is inclined to defend his friend against his critics even if his arguments tend to be based in emotion rather than reason. The only criticism he himself is willing to levy is with respect to his hero’s noted disregard for his children and the women in his life, and his desire to find refuge from their demands on his energies. Still, Montaigne’s withdrawal to his tower to contemplate the nature of the self – that is, the self that interests him most dearly: his own – is a choice that draws Zweig’s sympathy and support. It is hard to argue with this sentiment. Two lovers of books, passionate about reading are bound to feel instant kinship, even when reaching across time and space. For a man in exile, cut off from his intellectual community in Europe, it is not difficult to imagine that Zweig felt he had found a soul mate in Montaigne. That is, he insists, the most voluntary death is the most beautiful. If Zweig who was known to struggle with depression had already contemplated suicide (and according to the translator’s introduction he had expressed that sentiment before), one cannot help but wonder if he found some measure of validation in Montaigne’s writings. This biography stands as an example of the deeply personal impact that literature can have on a reader. Zweig argues that there are writers who come to you, or come back to you, at the time when you are ready to hear them. This final work took precedence over any of this other writing projects in the months leading up to February 22, 1942, the day he and his wife each took an overdose of barbiturates and lay down together hand in hand. In a sense Montaigne exists as a final effort for a sensitive writer to make peace with a world that seemed to have spun off its axis. For that reason alone it is worth the read. Translated from the German by Will Stone, Montaigne by Stefan Zweig is a new released from Pushkin Books. A very thoughtful review…it sounds as though this book offers a very poignant insight into Zweig’s state of mind during those final months. I’ve been looking at his memoir (The World Of Yesterday) as a possibility for the future. Have you read it by any chance? Thank you Jacqui. This is actually my first Zweig. I have two buried on an e-reader so of course I tend to forget they are there. Pushkin will be releasing a volume of 4 novellas next year (it may be out in the UK already), but I just received a galley of that and I think I will start with that. I have the galley of the novellas and hope to,read at l sat one this month. What a lovely review. Zweig was such a wonderful writer, and I hadn’t realised he’d been writing this so close to the end of his life. I’ll look out for it. Thanks. The placement of this work at this point in time makes it especially poignant. As I was mentioning to Jacqui it is my first Zweig, but I have more lined up for the future. Woyld this work as an introduction to Montaigne? Or do you need to know much about him before reading it? I read Zweig’s book on Casanova and enjoyed it. I’m always ‘just about’ to read Casanova’s memoirs. It could be an introduction if you keep in mind that it is overly personal in tone. But then I think Montaigne inspires that response. I have not read him directly but am waiting for a copy of the complete works from the library so I can get a sense of a good place to start. He was a fascinating thinker and essayist who was not an academic. But he was also wealthy and able to afford to hide away in a tower lined in books and lose track of how many of his children lived or died! A introduction to Montaigne that I really enjoyed is When I Am Playing With My Cat, How Do I Know that She Is Not Playing With Me? by Saul Frampton. I’ve read a lot of Zweig’s fiction but very little of his non-fiction. I’m much more intrigued by this, however, now that I’ve read your review – it sounds like a very personal book for Zweig. I got the impression from the introduction that this is less polished than many of his other biographies. If he had had more time he probably would have trimmed back some of the excessive cheer leading. But in the context of his life, this volume makes for a powerful insight into the mind of a man (Zweig) who may have been seeking the most inward of answers at the moment that he encountered a writer who made a career of searching his own soul. Thanks for this beautiful post. Readers can connect across generations. I loved the story of Zweig finding the book was n his last residence. I have read his bio of Balzac and greatly enjoyed it. He helped me understand Balzac. I have a review copy of this and hope to read it soon. Thank you for your comment. It was nice to sample something a little different. I have a lot to chose from but seem to be a little distracted meaning that I have opened and started too many books at once! 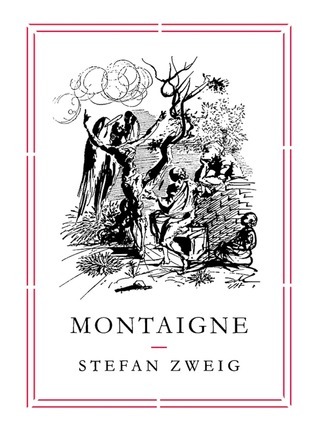 I like Zweig and I love Montaigne. I had no idea Zweig wrote about him at all. I am going to have to get myself a copy of this book! Thanks for bringing it to my attention! I wasn’t aware that this was his last book. I really like your review. Zweig is still seen as a bit of lightweight in Germany. He can be a bit mawkish at times but not in his nonfiction, I’d say. I got this as a galley so I had no idea how very close it was to the end of his life when it was written. It comes across as a bit of a fan letter, and given the context, a little sad. Writers who produce more popular or “lighter” works are often very well read and it almost seems as if it was the intellectual isolation of his exile that led Zweig to his tragic end. I agree. He must have felt very isolated. Montaigne’s Essays have always been a lifelong companion to me. If I had to choose just a handful of books from my library, this would be one of them. Now that I read your interesting review, I wonder why I never read Zweig’s Montaigne book. But I will change that for sure in the near future. Zweig wrote in Petropolis also a book about his guest country: Brazil, A Land of the Future (Brasilien – Ein Land der Zukunft). It is a very optimistic book, full of admiration and affection for his new home. It’s sad that Zweig had such a strong feeling that the world to which he belonged was collapsing and that taking his life together with his wife was the only thing left to do. This book is a wonderful look into that moment, across the centuries, when writer and reader connect. The final work is not as fully edited as Zweig might have wanted under other circumstances and in that there is a current that runs through the text that is vulnerable and almost too eager to find solace. Is that solace found or not? Only Zweig would know.